igus® was founded in Germany in a double garage, back in 1964. For the first 20 years, the company worked as a supplier of complex technical polymer components. However, in 1983 Frank Blase established reinforced plastic Energy Chain Systems® and injection moulded polymer bearings as two distinct product groups and set up a network of sales engineers. These seemingly unrelated products are linked together through the belief in making functionally advanced, yet affordable polymer components and assemblies. Between 1985 and 2010, igus grew from 40 to more than 1,600 employees distributed between the head office in Germany and 26 subsidiary companies around the world. igus also has representative partners in more than 33 other countries. igus will continue to invest in expansion in the coming years, thanks to the opportunities for growth provided by modern materials. The mission of igus is to use its innovative polymer materials to develop products that provide creative solutions and exceed our customers’ expectations while delivering fast, accurate service. NEW TESTING STANDARDS GUARANTEE CABLE RELIABILITY IN MARITIME APPLICATIONS In order to utilize cables for motion control application aboard ships and on other offshore applications without expensive custom certified solutions, igus and the Germanischer Lloyd (GL) classification group have jointly developed a new test standard, and have certified a total of 328 Chainflex cables from igus, making them the first cables to receive this certification specifically for use in cable carriers, making the company a leader in the manufacturing industry with the most certifications for cables. Due to the distinct increase in the level of automation aboard ships and other offshore applications in recent years, the industry has also experienced a notable growth in demand of Energy Chains and cable carriers. To supply suitable and reliable products for these specialized applications, igus had teamed up with GL to certify igus’ line of Chainflex continuous-flex cables. 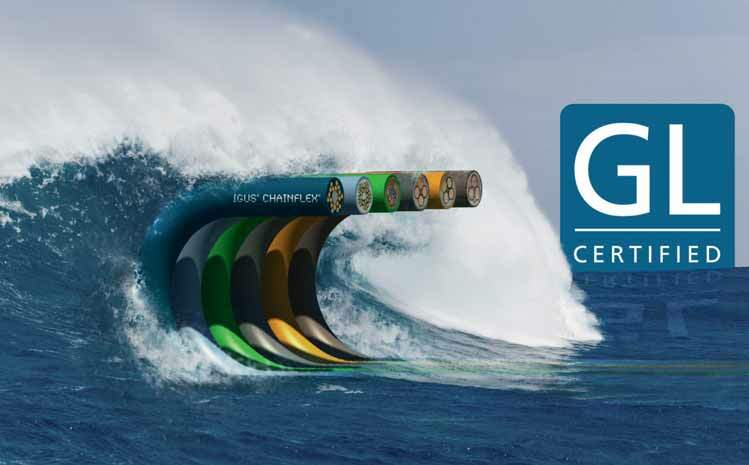 The lengthy certification process took the companies three years, using a range of testing and specialized expertise from both organizations, resulting in the first series of GL certified cables for use offshore. Typically, classification organizations such as GL issue certifications based on widely accepted international standards. In many cases, these refer to special characteristics in regards to specific material or component properties, such as combustion or flammability. However, these materials typically have no or limited suitability for use in continuous-motion applications. Since no uniform international test procedures for motion control cables in place, a new standard for testing needed to be found. The teams from igus and GL worked together to develop testing procedures to guarantee reliability of Chainflex cables offshore. The two partners employed internal igus standards as a basis for guaranteeing the service life of cables in motion control applications. This information was supplemented by the typical standard tests of production samples performed by the GL certification group, which are based on international standards and years of testing. Customers now have the option to buy control, Bus, data, measurement, and power cables specifically for dynamic applications that comply with the requirements of commercial shipping regulatory agencies, all available from stock. Innovation and product development are natural elements of Indexator Rotator Systems’s daily operations. The Hydraulic Brake Control (BC) has now been released as an additional development of Indexator’s MPB-system. BC activates brake function only when it is beneficial, but in particular, brake function is disconnected when not needed. There are now varieties available of Indexator’s proven MPB brake links to forwarders and trucks with the function Hydraulic Brake Control (BC). BC is a hydraulic control of the brake function, which ensures activation only when needed. Brake function will be activated when the grapple is empty, but deactivated with loaded grapple to reduce brake torque interference in the weighing process. “The greatest advantage of BC is that the powerful MPB brake can be combined with crane scales without risking the weighing precision due to high braking torque,” says Sales and Marketing Manager, Erik Svensson. The interface towards crane and grapple is the same as usual, even when mounting a rotator and swing dampener prepared for BC. Hence BC can be easily installed without the need for additional features or more hoses. BC uses the same wear parts as other MPB swing dampers, and besides better conditions for weighing, BC also reduces wear on the brake pads and brake discs significantly. Additional features or more hoses is not required. Pintsch Bubenzer is a major force in the provision of service brakes, emergency braking systems, couplings, monitoring systems and more. The company focuses on the design, production and service of high quality braking systems for both static and dynamic applications which involve the precise control of small to very large amounts of kinetic energy. The challenge is to control that energy in the most efficient, cost-effective way. Pintsch Bubenzer is active in the sectors of port, shipbuilding and offshore engineering, mining, the steel industry, utilization of wind, mechanical engineering and construction of special vehicles. It is world-renowned in braking system design and manufacturing, with safety built into every product. For the purposes of this article, the ‘cranes for material handling’, ‘ship & offshore’ and ‘steel industry’ markets are of the greatest interest. In the application segment of port engineering, Pintsch Bubenzer has worked very closely together with port operators and consultants, as well as crane manufacturers and chandlers internationally for many years. The global application know-how built up in this way secures continuous improvements in the quality-determining criteria for all participating parties and enables us to develop our products, technologies and services still further to the highest level in a manner suitable for real- work situations. As a result of factors such as temperature variations, storms, contact with saltwater, flooding and downtimes, marine applications place the very highest qualitative demands on the braking systems used in respect of their design, the materials used, manufacturing, installation and surface protection. Thus corrosion resistance and absolute water resistance (up to IP 67) coupled at the same time with the ability for maintenance to be carried out in a simple manner — literally with what is on board — are among the mandatory criteria. Brakes and braking systems from Pintsch Bubenzer have been setting the standard on ships of different sizes and classes as well as on ocean giants since 1935 and are today the first selection for many well-known ship's chandlers and offshore-engineering manufacturers. High ambient temperatures and dust-filled air are typical environmental conditions associated with the processing of steel. This environment places tough demands on the drive systems and brakes used in steel making facilities. Hot metal, semi- automated rolling mill and overhead loading cranes require the most reliable, maintenance-friendly braking systems available. The engineers and designers at Pintsch Bubenzer have decades of experience on such applications for the steel industry and know the problem zones and pitfalls of such applications back to front. Anti-snag-systems: The mechanical anti-snag system separates the motor and gearing in a flash and prevents gear damage and tears in the steel structure of the units. Couplings: Couplings serve for compensating relocation movements and for absorbing torque shocks that occur on starting and under load. Storm brakes: The use of storm brakes prevents a crane from being moved by high winds or gusts. Service brakes: Service brakes are installed at the (high-speed) gear input shaft to hold the load safely. Emergency brakes: Emergency brakes are installed at the (high-speed) gear input shaft to hold the load safely. Monitoring systems: Monitoring systems guarantee the 100% availability of the equipment and minimize maintenance expenses. Pintsch Bubenzer supplies safety-relevant components for the avoidance of accidents and for the protection of human life. its quality guidelines are binding. SIBRE – Siegerland Bremsen designs, manufactures and distributes industrial brake systems and drive components. The customers for its industrial brakes (e.g. hoist brakes) are consultants, OEMs and operators in heavy duty industries such as — but not limited to — ports, steel mills, mining and regenerative energies. All SIBRE’s products and processes are characterized by safety, reliability, sustainability and high quality certified according to ISO 9001. SIBRE has over 50 years of experience and expertise. It is able to provide high-level services, right from product development through to brake manufacturing, to commissioning. It offers worldwide service with specific maintenance agreements. drive components (crane wheels, buffers, drum couplings). The disc brake type USB 3 is a complete new development and forms a combination of spring and weight applied brakes. These brakes are designed considering the specific demands of crane-, lifting- and material handling applications and is the consequent result of the continuous research and development performed by SIBRE. Combined with another improvement of the SIBRE lining wear compensator the advantages allow to consider this USB 3 type brakes as the first real almost maintenance-free disc brakes. The new brake system has been created in two sizes and thus provides a solution for different brake tasks. Wheels are machine-components with load bearing function. When selecting wheels and their material quality, a broad variety of options is available. SIBRE’s production portfolio includes separate wheels of diameter 315mm to 1,000mm, as well as complete wheel assemblies similar to DIN, as per customer drawing or as design proposal approved by the customer. SIBRE standard wheels are made of forged cylinders of material 42CrMo4V. The handling of dry bulk materials used to be a completely manual process, but it is now being increasingly automated in a drive to reduce both the costs and the risks of injury, while also increasing throughput and accuracy. The demands of today’s highly competitive commerce and modern industry are such that speed, accuracy and efficiency are required within every process. This includes the handling of dry bulk materials, such as grain, coal, aggregates, minerals and chemicals through every stage of their logistical journey from producer through processor and distributor to eventual end-user. Not surprisingly, major handling facilities are now highly computerized, and often have a control room with a bank of computers, which would not look out of place on the USS Enterprise. Their job can be summed up as collecting information from many, many different sources, collating it, and then calculating the optimum procedures for every stage of the overall process. The computers represent a well-developed technology and their data processing abilities, while hugely impressive, are based on relatively simple logic algorithms. The technology developments that are driving the advancement of bulk handling are at the sensing end of the system, where the prevailing conditions of the moment are detected and converted into data signals for the computer to use. “Sensors are the eyes and ears of the computerized system,” says Mark Ingham of Sensor Technology Ltd, one of the companies at the forefront of developments. “They constantly monitor what is going on and feed real-time data to the computer.” One of their latest products is a load sensor with a difference. Called LoadSense, it is wireless, so is ultra easy to deploy in situations like docks and grain banks where installing cables would be difficult – and maintaining them even harder! LoadSense is online permanently and constantly sends real- time load value signals to the central computer or its own local computer or receiver for preliminary analysis. It can be used in all types of materials handling operations, but is particularly useful for measuring loads in augers and on conveyors, where materials are ‘in flight’, so the load varies constantly with time. LoadSense can be thought of as a two-part system. First, is a strain gauge-based stainless steel tension type sensor, with a twin antenna transmitter built into it for transferring the load data the instance it is generated. The second part of LoadSense is the receiver, which can be either fixed in place or handheld. The receiver reads, displays and records the data and can pass it onto the central control system for integration with other data streams for analysis. The receiver includes an in-built 32MBit memory, which can hold up to 280 hours of data, thus providing both a local control station and a backup databank for the wider system. It is also notable that each receiver can collect data from several nearby load sensors simultaneously, in a range of up to 100m. Importantly, the LoadSense transmits using the worldwide licence-free frequency of 2.4GHz, so can be installed and operated freely without disrupting other radio-based equipment. In operation, data is transmitted at up to ten times a second, so LoadSense is constantly updating and providing real-time information so that operations can be optimized for best results. The key benefits LoadSense brings to materials handling installations include: the simplicity of wireless installation, easy reconfiguration, its long battery life (which is complemented by easy recharging), and the dual antennas which represent just one part of the overall rugged design. Since its development LoadSense has been adopted by many other industries, too. For instance, in forestry tree harvesting is often best done by pulling the trees over with a large tractor — this uproots them, so that the whole tree is recovered and also the ground is left stump-free so is in better condition for reuse — a LoadSense on the pulling cable will provide the tractor driver with vital live information and also collect data on harvest volumes for commercial analysis. They have also proved popular in the fly towers of theatres, allowing scenery and backdrops to be raised and lowered quickly and safely, for materials monitoring in road laying and civil engineering, in food production and processing, etc.